This past Sunday was the Sampler Guild of the Rockies 2nd annual Christmas tea. It was a blast! Each table was set for tea for eight. Complete with tea sets, place settings and center pieces. I sat at the blue and white table. A member brought her Willow Wood design place setting (I think that is what she called it) and I wish I had thought to take a picture the table was beautiful - as were all the others. The setting included the creamer, sugar, tea pot and tea plates. My table had blue felt table runners crossing in the middle of the round table; a center piece of pine codes, a silver piler candle and a blue jay. Each plate had a blue napkin with hand made napkin ring consisting of a strip of white paper tied with white and blue ribbons and a big silver bell. Snow cutouts and star glitter were scattered on the table. Writing this now I REALLY wish I had thought to take a picture. Well when I got home I did take pictures of the goodies I got while at the party and so here goes the show! Events included a stitched ornament exchange and this is what I made. 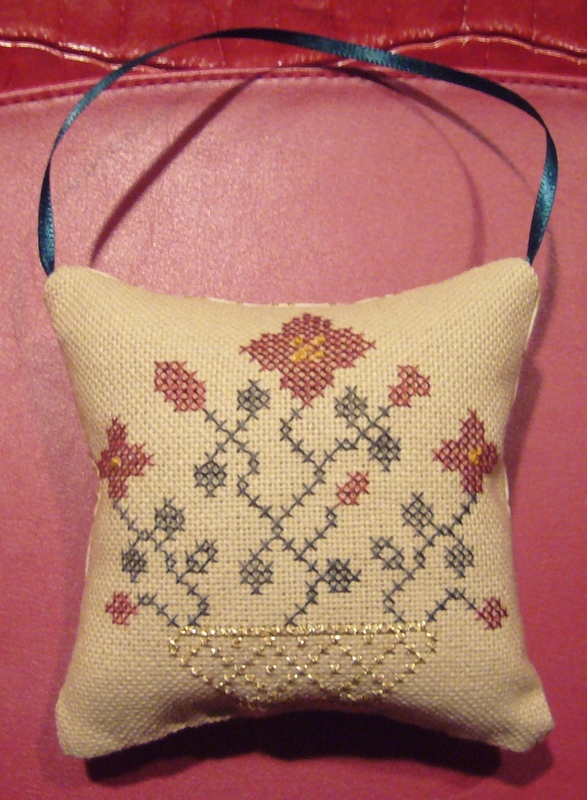 It is a freebie chart from Mary Corbet's Needle 'n Thread post on Oct. 8. 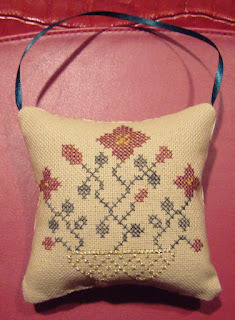 2010 about developing a spot sampler I used floss and kreinik from my stash. Next is the ornament I received from Patti (aka Rocky Mountain Stitcher). It is a Black Bird Design from the Just Cross Stitch Ornament issue﻿. Look closely and you will see SGR and Patti's initials and 2010 in white work at the lower left and right sides. What a nice touch! I tried not to reduce the picture in hopes it will get bigger when you click on it. 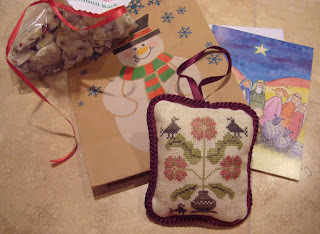 The snowman bag also had some yummy cranberry pistachio almond bark (now gone) and a nice card. What great ornaments! I love the idea of the tea for guild - may have to suggest that to my guild. Very pretty!!!! Wasn't the tea lots of fun :-). Your tea looks like it was a lot of fun! I love the ornaments. You stitched and received a beautiful ornament!